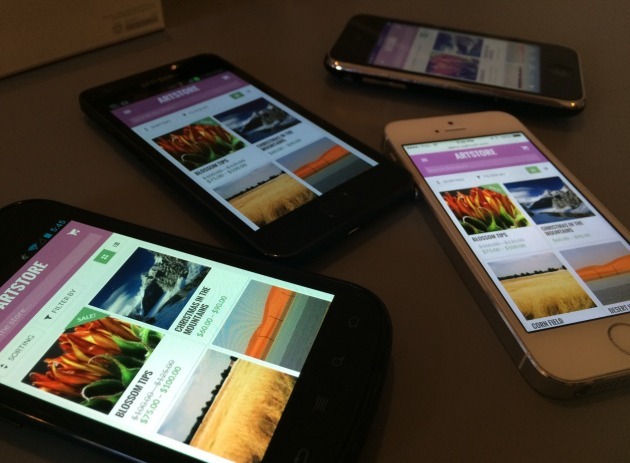 WPtouch is a complete mobile solution for WordPress. It provides various mobile themes for you to choose from, all of which are designed specifically to look and work great on all mobile devices. According to the WPtouch team, their themes load up to 5 times faster than most desktop & responsive themes. They all use hardware-accelerated visual effects that add that extra styling advantage over your normal responsive themes. They’ve also gone the extra step of only using CSS3 and vector icons to make sure all graphics look crisp and clean while keeping their load to a minimum, as well as creating touch-specific enhancements to make your user’s experience fast and efficient. WPtouch Pro 3 Teaser Video from BraveNewCode Inc. on Vimeo. 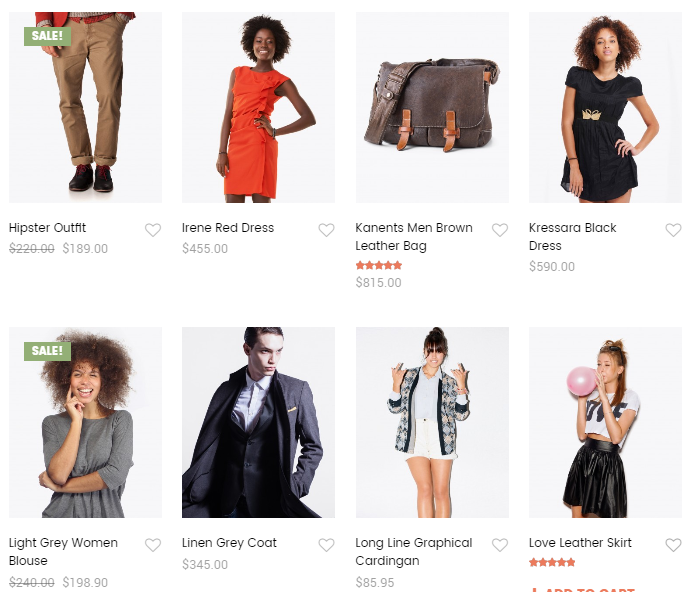 Below I’ll be going through the MobileStore theme and it’s awesome features before guiding you through the process of setting up WPtouch with this online store theme. 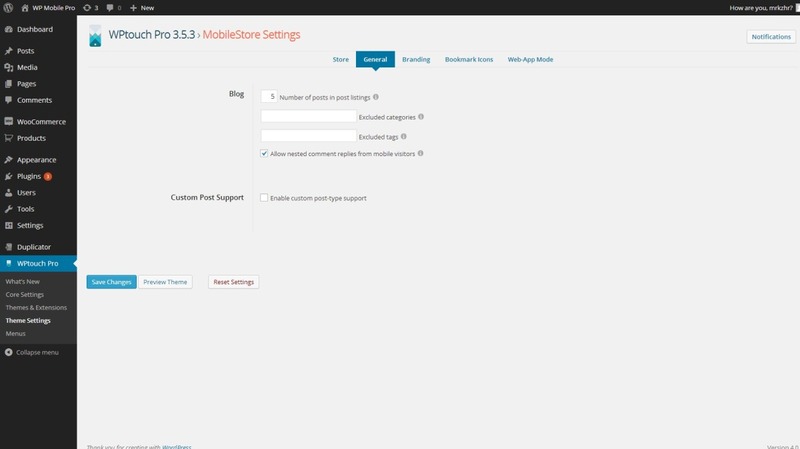 The new MobileStore theme from WPtouch. This theme was designed and built on the power of WPtouch Pro. It was made specifically for mobile devices and the most popular eCommerce plugin for WordPress, WooCommerce. In fact it integrates seamlessly with WooCommerce to create a quality mobile shopping experience. It uses isotope to make sure all your products are laid out neatly in a grid or list view. 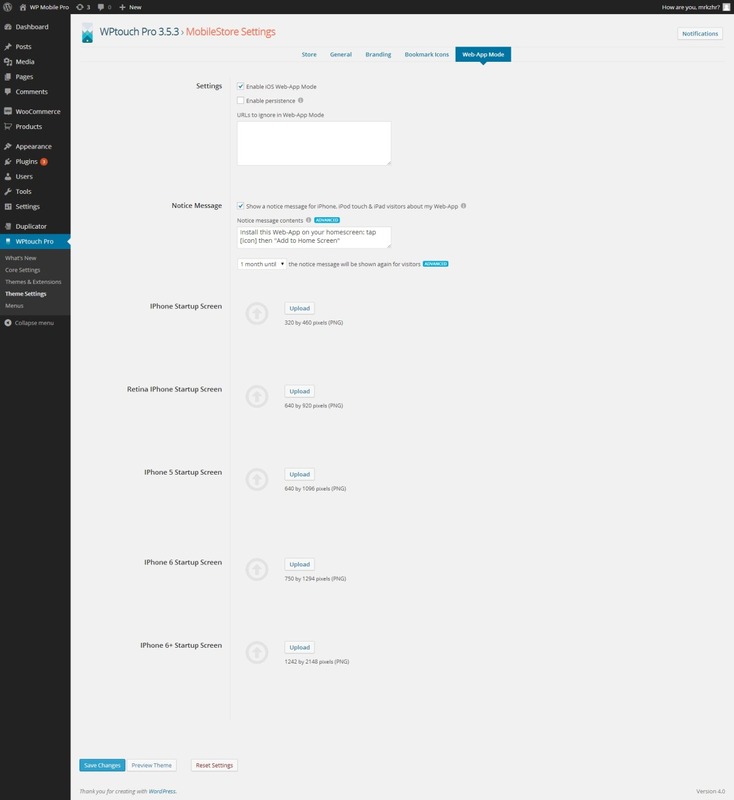 Your customers will also be able to filter and sort your products with ease and the theme even goes the extra step to remember and restore where you were in a product listing. Quite smart. On either side of every page you’ll always find two hidden menus. 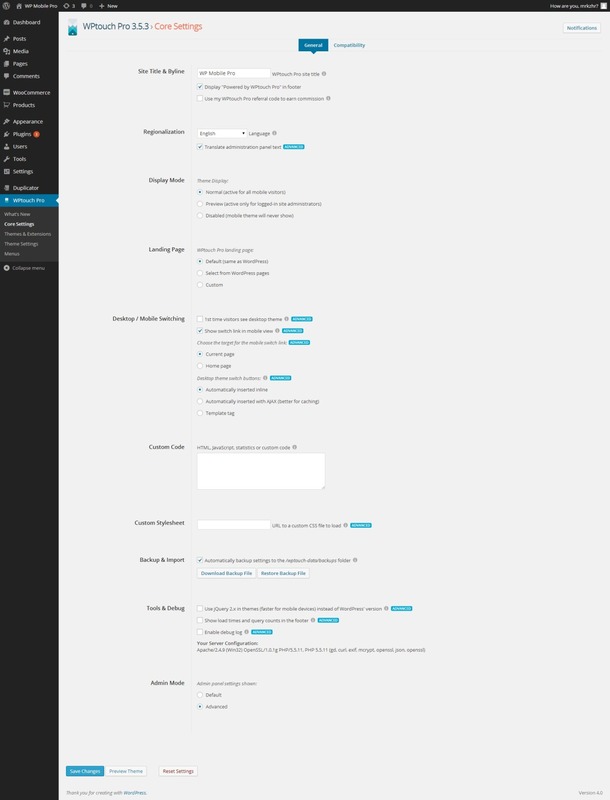 On the left is a ‘Product Categories’ menu with the categories, recently viewed items and site navigation. On the right is a ‘Mini-Cart’ showing what you’ve added to your basket so far. These are convenient for your users and they also guide them to making that elusive purchase. The checkout process is streamlined to make it quick and easy for your users, ensuring you don’t lost any potential customers due to any complicated payment methods. It’s also got a few more features you can see in the screenshot below. All of this (along with the fact that it’s used by so many top companies – read more below) proves that this theme can do a great job at showcasing your products and getting them sold, fast. I gave this theme a go myself to see how easy or hard it was to set up and use. I can safely say it’s as smooth as the developers claim it to be. The side-menus are very convenient and they make the buying process that much easier and quicker. The WooCommerce integration works great and it assures me that I’m using one of the best and proven platforms to sell my products online. When you want to make sure your online sales start high and remain high, you want to be sure your customers don’t have any extra steps to go through that can slow their process down. The streamlined MobileStore theme works fast and smooth enough to ensure a quick and painless process for your customers. Besides raking in more money into your account too. You’ve purchased the plugin and downloaded the zip file. 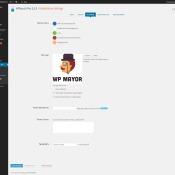 Go to the plugins section in your WordPress dashboard and upload the file. Hit activate. 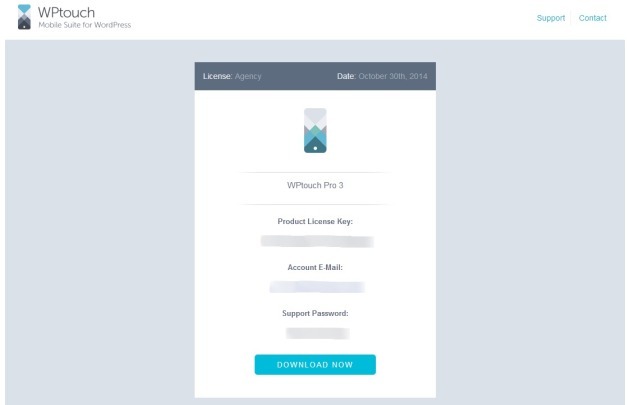 When you purchase WPtouch Pro a license will be sent via an email like the one below with your license key, account email and support password. 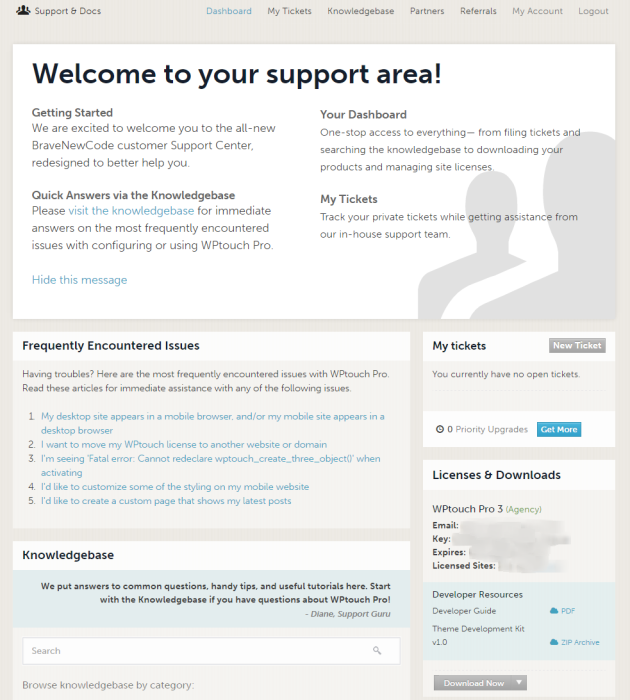 At the bottom of the WPtouch Pro sub-menu on the WordPress dashboard head to Licenses and enter this information. Your product is now licensed and ready to go. Now we can start playing around with the plugin. First up you should set your Core Settings. These are split into General and Compatibility. Before you start setting anything, select General and head to the very bottom of the settings list. Here you’ll see an Admin Mode option. Set this to Advanced to make sure you can view and change all the plugin’s settings. You’ll now be able to see much more settings options that all have an Advanced icon next to them. So, the Core Settings. 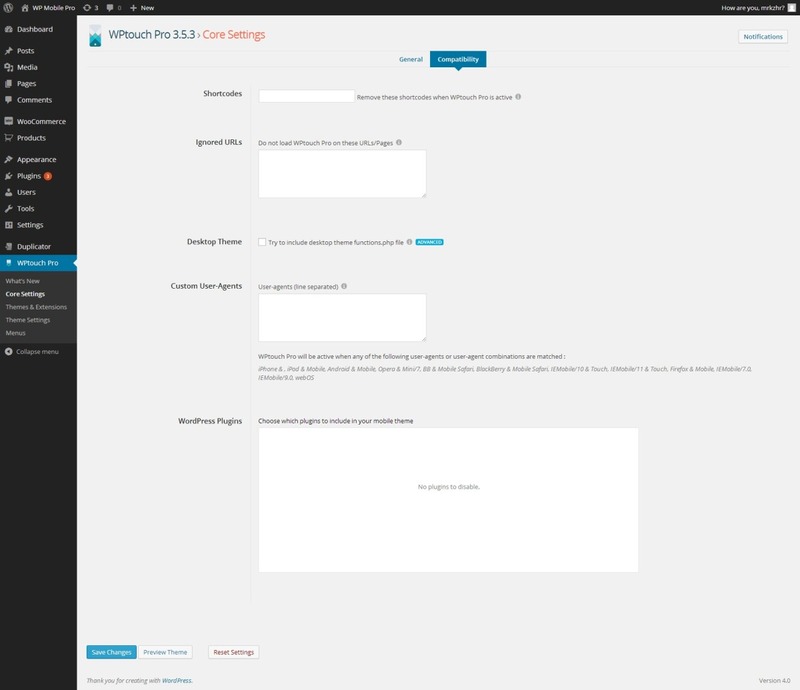 From the General Settings you’re free to set all the basic options you’ll need that will apply to the whole plugin, ranging from just the site title and language to switching links, custom code and tools & debugging. The Compatibility Settings are just that. You’ve got various options to set according to your needs and requirements. These include a list of shortcodes to remove when running WPtouch Pro, a list of URLs on which not to run the WPtouch Pro plugin, a choice of which plugins to include in your mobile theme and more. In case there’s an option you don’t fully comprehend the developers have placed information icons you can hover over for a brief explanation. So far it’s easy going and if there’s something you’re not quite sure about you can always come back and change it later. Once those core settings are all set it’s time to choose your Theme. 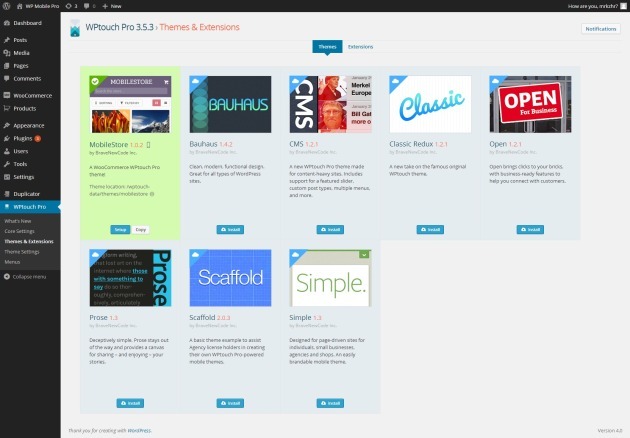 WPtouch Pro currently has 8 themes available that can all be seen in the screenshot below. Clicking on the image of each one will open up a mobile-sized window with a preview where you can see it in action and give it a go before installing it. Since I’ll be reviewing the MobileStore theme today I’ll be referring mainly to it. So, I’ve installed and activated it, now it’s time to set it up. By clicking on Setup you’ll be taken to the Theme Settings section. These are in turn split into various sub-menus, all dependant on the theme you’ve selected. 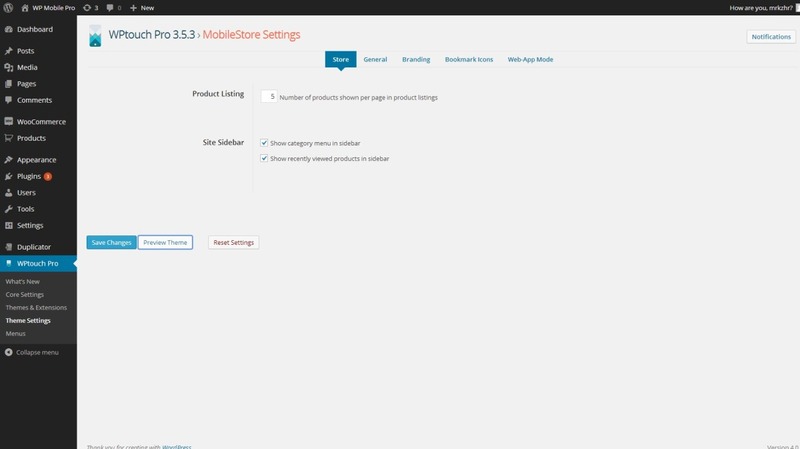 For MobileStore you have tabs for Store, General, Branding, Bookmark Icons and Web-App Mode. You can have a better look at each one in the gallery below. The settings vary from selecting the number of products shown per page in product listings to custom post support, branding colours, logos, typography choices and even uploading iPhone startup screens for the iOS web-app mode. Once again they all have information icons that you can hover over for further explanation. Besides choosing a theme you can also add Extensions. There are 4 currently available as can be seen in the screenshot below. It’s just a case of choosing the ones you want and hitting Install. Then click on Setup and you can start using the extension as you need. Mobile Content allows mobile-specific content to be shown instead of your regular content on posts & pages. Infinity Cache is a lightweight caching module designed specifically for WPtouch Pro. Responsive Image provides significant performance increases for mobile sites by serving appropriate image sizes on a per-device basis. Multi-Ads is used to maximize revenue with multiple advertising units per page and built-in A/B advertising unit testing. Once again each extension has its own settings. 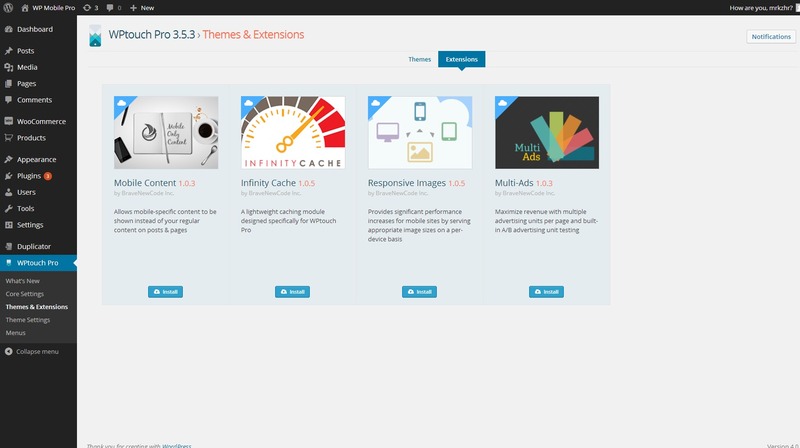 You can find them in the Theme Extensions section under two main tabs; General & Multi-Ads. The final menu item under WPtouch Pro is Menus. 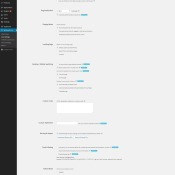 This is nothing more than a place to choose your Primary Menu, Footer Menu and Menu Options as seen below. As you can see from all the screenshots above most of the settings are pretty intuitive. And if you don’t think so there are the information icons to give you a quick explanation as to what each setting does. 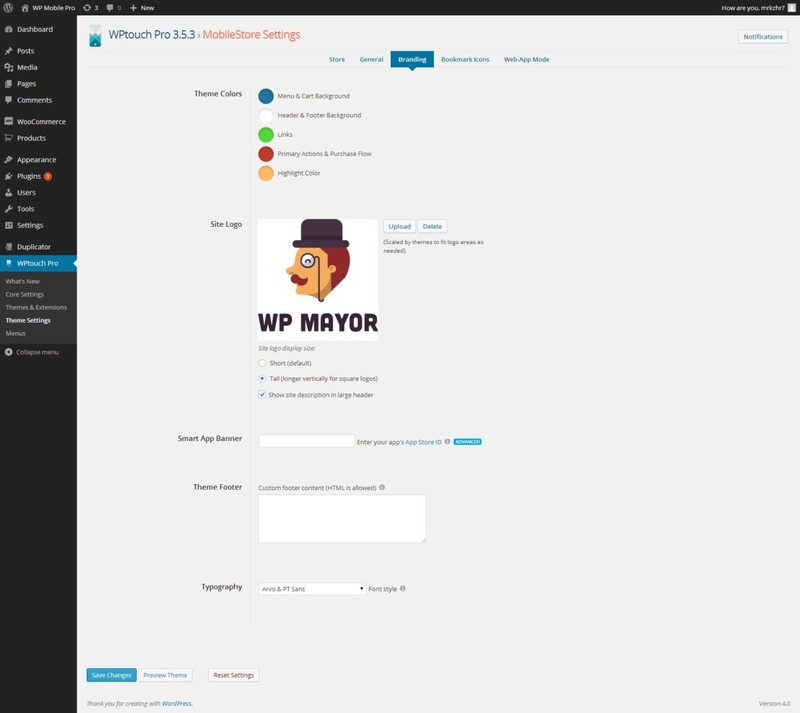 Besides that there is also a ‘Preview Theme’ button at the bottom of every backend page. Click on this at any time and a new window will open up showing you what the theme of your choice will look like on a mobile phone’s screen using the settings you’ve applied. If for whatever reason you’d like to go back to the original settings of the plugin you’re also given a ‘Reset Settings’ button next to the preview one which will automatically do this for you. Should there be something you cannot understand or you want to get a better idea of how it works there’s the documentation that’s provided with the plugin. I had a look through the documentation myself. They’ve included a few questions that are most frequently asked by users and their explanations are detailed and really easy to understand. They even included screenshots of all the processes to make it that much easier to follow the instructions. 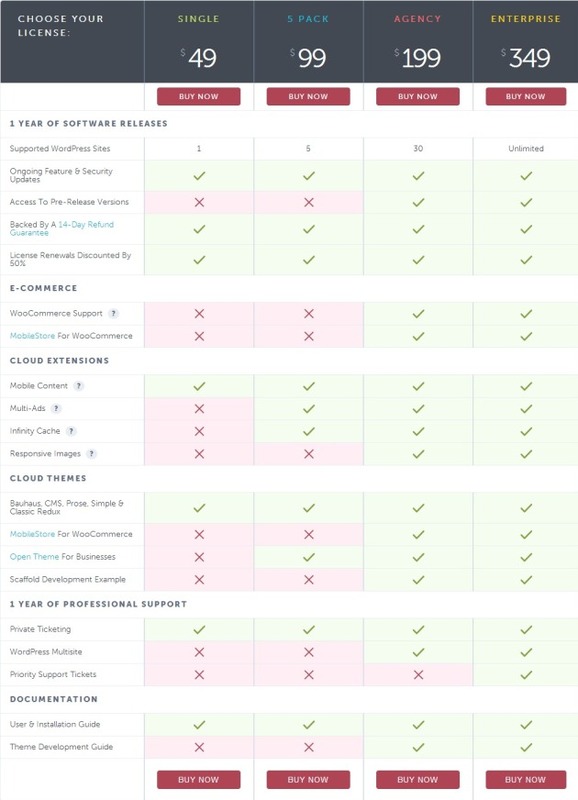 You’re even given some free Developer Resources such as the Developer Guide PDF and a Theme Development Kit that can be downloaded from within the support dashboard that you can see above. Whatever it is that you need I’m sure you’ll find it on their support pages. 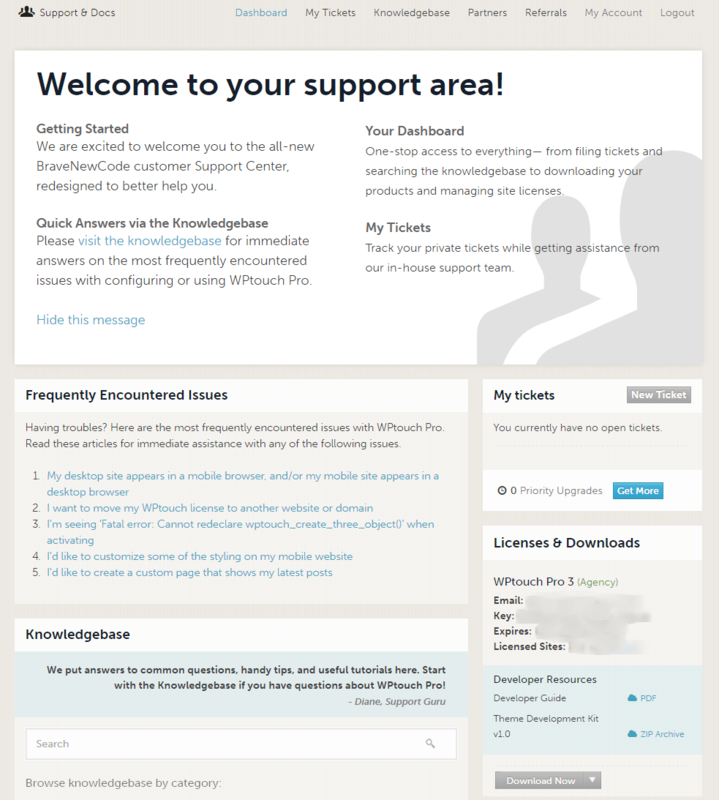 If you’re REALLY stuck ,or something goes terribly wrong, or there isn’t any help for your problem int he documentation pages you can always contact support through their ticket system. If it’s so good, who else is using it right now? WPtouch claims it has over 2 million websites worldwide relying on it for their mobile versions, but as with any other plugin it’s always nice to know that there are major companies and business out there making use of the same plugin that you’re interested in purchasing. With WPtouch you can rest assured that you’re joining a long list of them. Some of the most notable businesses and companies currently using WPtouch include CNN, Disney and even Sony. As you can see with WPtouch Pro as well as MobileStore you can set up one of the best mobile stores possible. You’ve got everything you might need in one plugin and theme, inclusive of all the online shop features I can possibly think of. There isn’t much to add here to be honest. I was impressed by the plugin’s versatility as a mobile version for your site as well as the look and feel of the MobileStore theme. If you’re looking for a way to showcase your shop in the best possible way on any mobile device, I recommend giving this combination a go. After all those 2 million websites using it right now can’t be wrong, can they? What do you think? 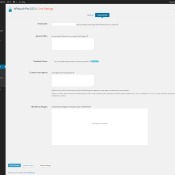 I’m currently working for EngineThemes – a team specialize in providing WordPress themes. 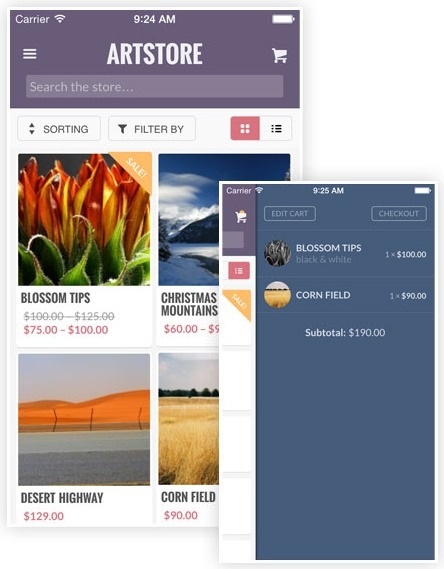 We’re working to integrate WooCommerce with our products, will check out this app right away. I believe it will help me a lot in my work, especially when we’re about to celebrate our 2nd birthday. used wptouch a few year back, always a good service from them. Thanks for the feedback and glad to hear you had good experiences with WPtouch. 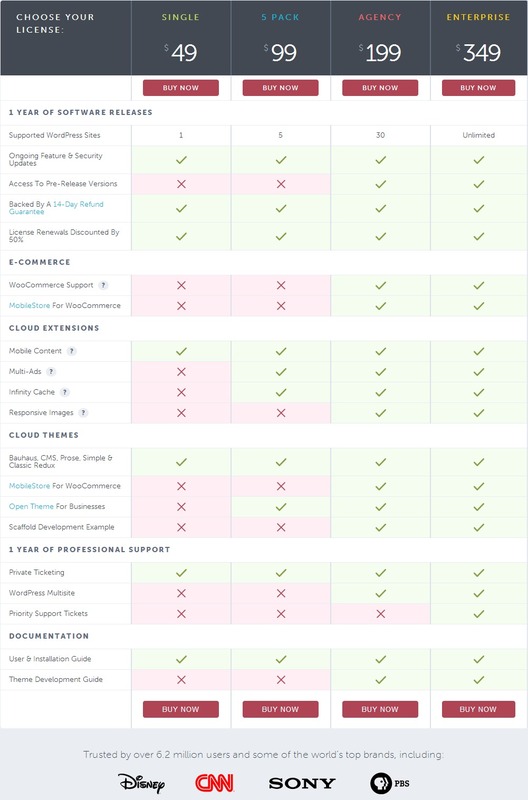 Why would you need to pay for a 30 site license? They have the 5 Pack licenses at $99 that sounds like it could work for you. 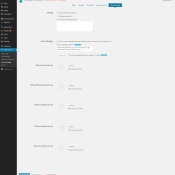 Gotyoiu I need mobilestore for woocommerce can I get 1 from 30 license please ? Yes, I also need the mobilestore. And the Theme is only available with agency license (30 Website). I am running only one site. WPTouch FREE version when activated generates bad performance @ Google PageSpeed: only 9 out of 100.